The annual Economic Commission for Africa Conference of African Ministers of Finance, Planning and Economic Development - COM2019 - kicked off in Marrakesh on Wednesday, with emphasis on the importance of digitalisation in enhancing African economies as the continent celebrates the first anniversary of the highly hailed and historic signing of the Africa Continental Free Trade Area – (CFTA). The weeklong event, which has also drawn various seasoned experts and policy-makers from inside and outside Africa, will weigh and evaluate this year's theme – Fiscal Policy, Trade and the Private Sector in the Digital Era: A strategy for Africa - against the backdrop of recent economic and social development on the continent. With the value of the global digital economy estimated at over $11.5 trillion and set to rise to over $23 trillion by 2025, according Vera Songwe - ECA Executive Secretary – the effects of digital trade and economy in Africa are points of key debate. "It is currently estimated to represent 15.5 per cent of global GDP and is expected to reach 25 per cent of global GDP in less than a decade [and] there has been a rise in the digital innovation hubs on the continent, such as the Silicon Savannah in Nairobi and the Kumasi Hive in Ghana, not to mention more solution-oriented technologies such as Flutterwave which has enabled global payment processing in Nigeria through a single, seamless platform. In 2018, this application was reported to have processed $1 billion worth of transactions." "Such digital developments can have a transformative effect across the economy by reducing barriers to entry and expanding market reach for businesses, creating jobs, and boosting both domestic and foreign trade in goods and services," she emphasised. Zouhair Chorfi, secretary general at Morocco's Ministry of Finance Morocco and incoming chair of the Committee of Experts of the CoM, adds further "Digitalisation is a great opportunity for Africa. It can transform Africa by increasing competitiveness, promoting strong integration, reducing the cost of doing business. Morocco is ready to play its part." 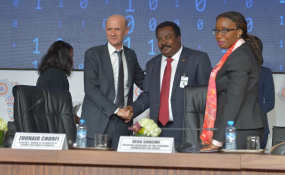 His predecessor, lsadig Bakheit llfaki Abdalla also proffered on the issue: "With the advent of digital age, Africa can leapfrog and use new technologies to push the continent's drive for sustainable development. The conference commenced with the official opening of 38th Meeting of the Committee of Experts deliberating on the 2019 theme itself amongst other statutory issues. This set the tone for the week's discussions, which will center on leveraging digital technologies to mobilize Africa's domestic resources, strengthen competitiveness and speed up growth in all developmental sectors. The conference will also provide a platform for delegates to review fiscal policies for the implementation of the CFTA. Adopted on 21 March 2018, the agreement is now 2 ratifications away from 22 member countries needed to enforce the trade bloc that envisages, among much more, a gross domestic product of more than $3trn and the creation of 300,000 direct and more than 2 million indirect jobs. Africa's largest economy, Nigeria and the host country Morocco are among those yet to ratify. Gender, youth, and climate change are also among other key issues in the spotlight as well as a special focus on the United Nations' support to the African Union's Year of Refugees, and Internally Displaced Persons. Another highlight will be the annual Adebayo Adedeji Lecture, named after ECA's longest serving Executive Secretary, the late Professor Adebayo Adedeji. The Lecture will pay tribute to the late thinker's contribution to the discourse on development of the African continent. Established by the Economic and Social Council (ECOSOC) of the United Nations (UN) in 1958 as one of the UN's five regional commissions, ECA's mandate is to promote the economic and social development of its member States, foster intra-regional integration, and promote international cooperation for Africa's development. ECA also provides technical advisory services to African governments, intergovernmental organizations and institutions. In addition, it formulates and promotes development assistance programs and acts as the executing agency for relevant operational projects. Made up of 54 member States, and playing a dual role as a regional arm of the UN and as a key component of the African institutional landscape, ECA is well positioned to make unique contributions to address the continent's developmental challenges. The ECA is headquartered in Addis Ababa, Ethiopia with offices in Rabat, Lusaka, Kigali, Niamey, Yaoundé and Dakar. The 52nd session of the Conference of African Ministers of Finance, Planning and Economic Development is taking place the Palmeraie Golf Palace in Marrakech, Morocco. The Committee of Experts will commence on Wednesday, 20 March and end on Friday, 22 March 2019. The ministerial segment of the Conference of Ministers will take place on Monday, 25 and Tuesday, 26 March 2019. The twentieth session of the Regional Coordination Mechanism for Africa (RCM-Africa) and side events will take place on Saturday, 23 and Sunday, 24 March 2019 at the same venue.